Welcome to Ridgelake Chinese Cresteds! Elegant Small Dogs - Chinese Crested Puppies for Sale. Ridgelake Chinese Cresteds is known for the best bloodlines of Chinese Cresteds in the US. 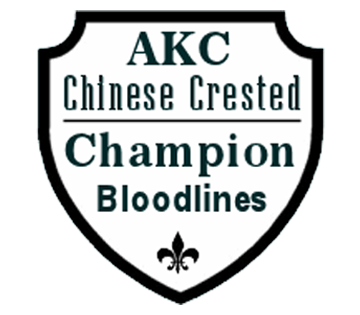 We breed and raise AKC Champion Chinese Cresteds Puppies for Sale. Ridgelake Chinese Cresteds is located in Rockwall, Texas, only 28 miles from Dallas - Fort Worth. Chinese Cresteds are also known as hairless dogs and powderpuff dogs. These adorable Hairless Dogs and Powderpuff Dogs are sweet and make wonderful indoor family dogs. 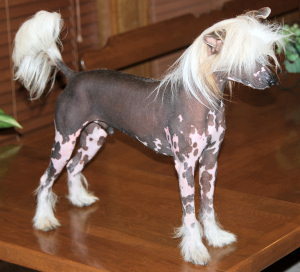 Chinese Crested Hairless Dogs make excellent pets for those who are allergic to dogs. These allergy resistant hairless dogs may be the best dogs for allergy sufferers. Being raised in my home, my dogs are loved and cared for and get a lot of attention from my family and other crested dogs as well. 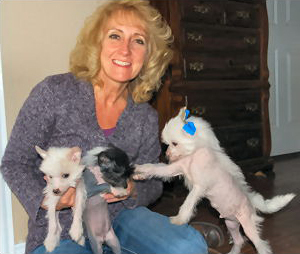 Our Chinese Crested puppies are highly socialized. These dogs make excellent companion dogs. Read more information about Chinese Crested dog history.